The Ukrainian poet Borys Humeniuk is angry. Angry at the Dutch media. Not because his poetry was badly received, but because he was portrayed as a member of a militia and an art-robber. “I am predominantly a writer and not a fighter,” Humeniuk stated in an interview with the Dutch newspaper Trouw. “I have an interest in art, I wrote about it for years.”1 Who is this poet from Ukraine of whom it is said that he has “run over the entire Ukrainian literature with a tank”?2 And how did he get this press coverage in the Netherlands? It is quite clear, this is war poetry (such a brilliant analysis, considering the unmistakable title Poems from War). 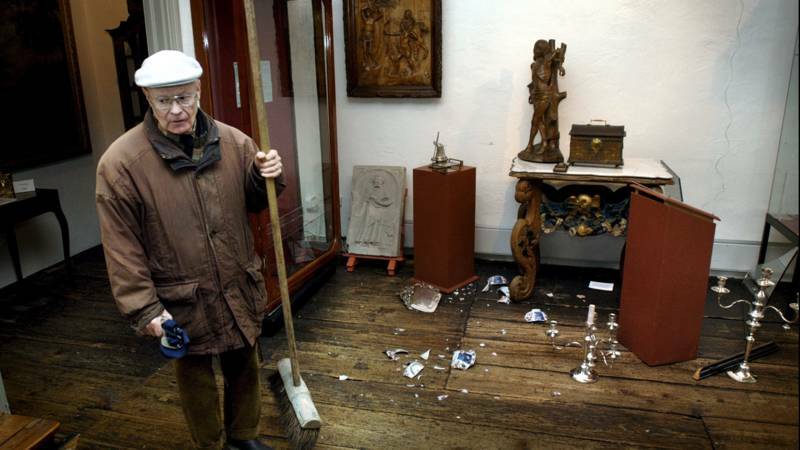 But why is Humeniuk described as a militia fighter and an art robber in the Dutch newspapers? Newspapers soon announced that the stolen art was in the hands of the militia that Humeniuk was a member of. Dutch art detective Arthur Brand was dispatched to Ukraine and stated that the militia demanded an absurd sum of money for the booty’s return.11 Rumors about Humeniuk started to appear: he was supposedly a member of the OUN militia. This Organization of Ukrainian Nationalists has its roots back in 1927 and has been dedicated to the creation of an independent Ukrainian state since then.12 After fighting the Soviet-Union, the people that claim its inheritance are now spearheading their forces against Vladimir Putin and are one of the factions in the complicated situation of today’s Ukraine. Meanwhile in the Ukraine the poems are nominated for the highest state award for art and culture: the Shevchenko Prize. Something tells me the Dutch haven’t heard the last of Humeniuk, but my gut feeling says chances to receive a Dutch prize for his poetry are next to none. Cats, Old Deuteronomy, …and Sugar Coated Anti-Semitism? !